Thinking about bringing your four-legged friend along on the family vacation this year? It can be a lot of fun to bring your dog on a road trip, but like every other member of the family, some planning is involved. 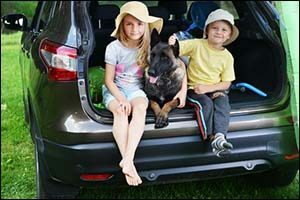 It is important to know what you need to bring, and what you can do to prepare in advance of your trip, to make sure that your canine has everything he needs to enjoy his first big vacation beyond the backyard or local dog park in Southeastern Massachusetts. The first thing that you will want to do to prepare for your trip is to make sure that your dog has current veterinary care in Massachusetts. This is especially true if it has been more than six months since your last visit to Anchor Animal Hospital in Dartmouth. Get your dog a “clean bill of health,” make sure to ask about or treat any of his anxiety issues in dogs, and then make sure to tell your vet about where you are going and what you will be doing. For example, if you are headed down to the southern part of the United States, you will want to look into heartworm treatment for dogs, if you aren’t already providing it to your dog locally. Flea medication may also be a good idea, especially if you will be staying at pet-friendly hotels along the way. You don’t want your dog to get any parasitic souvenirs along the way. BONUS TIP – Make sure to get a printed out copy of your dog’s medical records. If your dog is on prescription medication, make sure to get extra or a written prescription for a re-fill, just in case there are any delays while you are traveling home. Get your vet’s business card and information, just in case anyone needs to contact them regarding treatment while you are out on the road. It is better to be safe and prepared, than sorry. When you bring a dog on a trip, you will need to schedule stops along the way for bathroom breaks. Your dog also needs to have the opportunity to get out and stretch his legs and check out the new environment. Having the attitude that the journey is just as important as the destination can help. It is also good for you and your other human passengers to take a break every 3-4 hours. Stop for 15-30 minutes, go for a walk, take a bathroom break, get some food and refreshment, and then get back on the road. You can also plan stops at pet-friendly locations, such as amazing dog parks and recreation areas. Ask your vet at Anchor Animal Hospital in Dartmouth for suggestions as well. You may be surprised at some of the options. Whether you are headed into new territory of are going someplace familiar, it pays to pay attention to your surroundings at all times. Make sure you are looking ahead to see where you are going, especially when outdoors walking your dog. Check on the weather report to avoid major situations, such as flooding, tornadoes and hurricanes, depending on the season. Make safety your first priority and be flexible enough to stop early for the night to ride out the weather or have alternate route options to avoid it all together, especially if there are anxiety issues in dogs that need to be considered. There are a lot of places that now allow pets. Make sure you check in advance if you are able to bring your pet to motels and hotels along the way, as well as ask about policies regarding extra costs and fees. There may even be other restrictions that you need to know about before you just show up with your dog. Best Western, La Quinta Inn & Suites, Motel 6 and other popular chains have positive pet policies, however you still need to check with each location for availability. Make sure to bring all of the essentials, such as medication that is required, including heartworm treatment for dogs, as well as anything else suggested by your vet. Food and food bowl, water and water bowl, collar and leash, extra collar and leash, crate, bedding, toys, protective clothing, pet-safe sunscreen and bug repellent, poop bags, treats, and anything else that your dog could require while traveling. If your dog is not crate-trained, make sure to start training in advance of your trip. Having a crate with a bed or bedding inside that is familiar will help your dog to relax and sleep better in new surroundings. Make sure that your dog’s license and ID tags are all current and up-to-date. Try to maintain your routine as much as possible while traveling, including walks, bathroom breaks and feeding. This will help your dog to feel more secure. Providing your dog with quality veterinary care in Massachusetts and taking time to think about your trip in advance will help make this a fun and exciting experience for you both. To schedule a pre-trip exam with your local animal hospital in Dartmouth, give us a call at 508-996-3731.